Sunny Sunflora! Pokemon One a Day, Series 2! 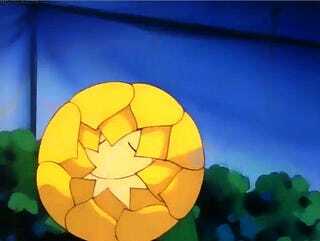 Sunkern and Sunflora are both losers. 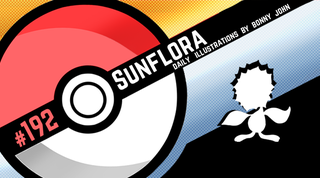 Sunkern's sorta cute, but Sunflora's a dork! The concept is sort of interesting with the creature being more active in the day, but then they went and added Cherrim or whatever that really plays up the sunlight aspect. What in the what!? A walking Sunflower gave me limited concepts to expand on. Eventually, I thought of Van Gogh's work and just wanted to paint a sunflower. I think that want was what let me work on building up the flower as seen in the WIPs. From there, I had to figure out something to make it a bit more exciting. On it's own, it was a weak illustration even if the technique and rendition came out solid enough. I looked at other flower paintings and saw many canvases being hung up as triptychs, and decided to use that as it wasn't something I'd done for the series in gen 1. I added a simple background to keep things from getting too messy and added shadows to the panels to give a little oomph. The final result gets the job done and is the best I could do for a creature I'm not too fond of! Design a badass plant based Pokemon! Come up with a name, give us the typing (grass/??? ), and what it's based off of in the real world if anything!